Dr. Kastner is a developmental psychologist, which means that she is very well acquainted with what research tells us about how the brain grows and learns across the lifespan. She is a colleague of Dr. Marsha Linehan (the founder of Dialectical Behavioral Therapy) and combines the powerful, research validated work of Dr. Linehan with her own vast knowledge of children. This book is the result. It is one that I haven’t read yet but it’s joining my “to read” pile. I decided to put it up on the site now, before having read it personally, because I have recently seen a video of Dr. Kastner speaking publicly and I think she has a wonderful, informed approach AND communicated these thoughts in an understandable manner. Not only do I suspect that this will be a very helpful resource for any parent, my hope is that this book will particularly make a great companion to Parenting a Child Who Has Intense Emotions: Dialectical Behavior Therapy Skills to Help Your Child Regulate Emotional Outbursts and Aggressive Behaviors by Pat Harvey, ACSW, LCSW-C. 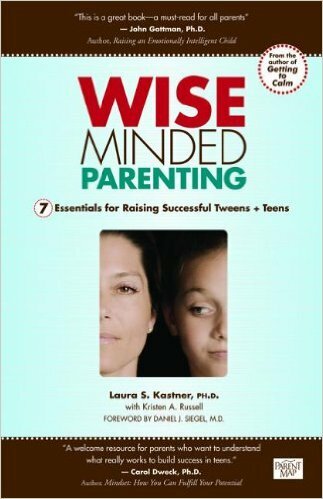 Reviews indicate that Dr.Kastner gives lots of concrete examples of things to say and do when intervening with your child. If you want to hear more from Dr. Kastner, jump on over to Teen Extremes: Regulating Moods in the Age of Anxiety with Dr. Marsha Linehan & Dr. Laura Kastner. Her talk starts around the 40 minute mark. Please use your own discretion when looking at resources on this site. There is no "one size fits all" idea so if it doesn't make sense for you, skip it and see what other helpful tidbits you can find. When in doubt, check with a licensed professional in your area about what might work best for you. © 2015-Present Copyright by Andrea Morganstein, all rights reserved for any original content on this site. I use copyright and trademark solely for the purpose of establishing that I am the originator of this content and not infringing on the legal rights of other entities.